Enhance your home with beautiful exterior doors that provide incredible durability, security, and energy efficiency. The aesthetically appealing doors offered by Clear Choice Home Improvements will instantly improve the curb appeal of your home and provide a warm welcome to visitors. As a family-owned and -operated company serving homeowners throughout New Hampshire and communities in southern Vermont, northern Massachusetts, and southern Maine, we understand the importance of having exterior doors that balance strength, beauty, and thermal efficiency. To ensure our customers receive only the best for their homes, we offer custom front entry and storm doors from trusted industry leader ProVia. 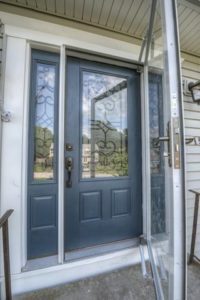 ProVia entry and storm doors have a number of unique benefits and customization options. Our high-quality entry doors are made in four unique styles of exceptionally durable fiberglass and steel and are available in a wide range of finishes, including woodgrains, so you can get exactly the look you want for your home. They also offer best-in-class energy efficiency, with features including dual perimeter seals, insulation channels, and more. If you’d like added security against the elements, there’s no better choice than ProVia storm doors. Unlike many other models on the market that may detract from the appearance of the front entryway on your home, our storm doors are available in many elegant styles to boost your residence’s curb appeal. Plus, they come with unique options such as InVent™ retractable screens that will allow you to let the breeze in on beautiful days. Most importantly, their sturdy aluminum construction will shield your entryway from even the worst weather conditions, such as wind-driven rain. While Clear Choice Home Improvements serves a wide area of New England, we make sure each customer feels well taken care of by providing hands-on and individualized service. We’ll work with you to ensure you get exterior doors that suit your unique needs and aesthetic preferences as well as your budget. When it comes to the installation, your project will be handled by trained and experienced specialists. And, any doors you receive from our company will come with a lifetime warranty, tremendous protection for your investment. Based in Manchester, NH, Clear Choice Home Improvements is proud to provide top-of-the-line exterior doors that are ideal for the regional climate. Contact us today to learn more about our selection of front entry and storm doors and the financing options we have available for qualified homeowners.